For Christmas, I got my very own nook! Wow, you can really see the difference between the e-ink upper screen and the lower touchscreen. That’s my red shirt reflected there. 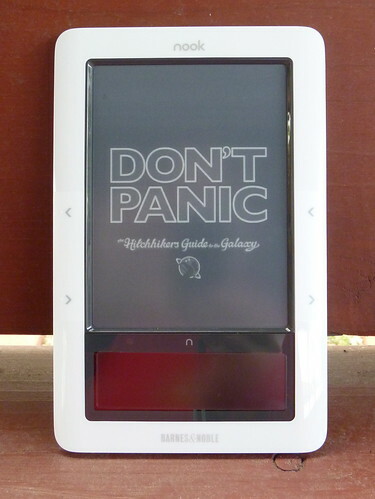 I’ve named it Trillian, and of course I gave it a “Don’t Panic” screensaver. The wallpaper is Dore’s Don Quixote in his Library. With Trillian in hand, I’ve decided to take on a third reading challenge for 2010. 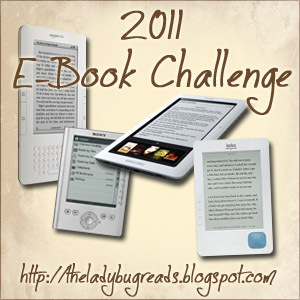 I’m going for the “Addicted” level – 12 e-books in 2011. I don’t have a list prepared for this one. We’ll see what I download. The official NaNoWriMo Word Counter says I have 50,426 words. I think I might have to buy myself a “winner” t-shirt. And on December 2nd, I am taking advantage of that discount on Scrivener. Happy Thanksgiving to those who are celebrating today. I’m thankful that I married a good cook, especially since I sliced my thumb open washing a knife last night. 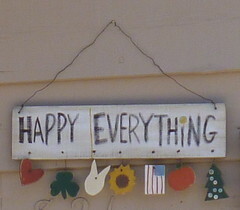 Seriously, I have much for which to be thankful. Now, if you’ll excuse me, Lil Miss and I have a parade to watch. Leave a comment on NaNoWhatNow? In late 2002, I was fresh out of Library School and still a new arrival to L.A. I only knew a few people, and none of them very well. I didn’t know the city at all. I had very little money. I had a tiny, tiny apartment and a PC that was on its last legs, although I didn’t know that quite yet. On that little old PC, I had started writing again, after taking a break following my graduation with a B.A. in Creative Writing. On November 1st, I started writing a novel. I didn’t have a great idea. I didn’t have an outline. I had a couple of characters and a concept that had had two false starts already. So why did I start writing? That day, I read an entry on Neil Gaiman’s blog that pointed me toward NaNoWriMo. I love the whole concept of NaNoWriMo. 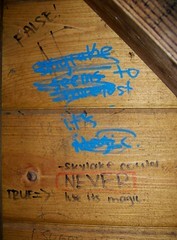 I know how easy it is to let those story ideas fade away without writing anything down. It’s even easier to write down the idea and abandon it when the writing gets hard. And it’s much, much easier to stop writing than to force your way past that Internal Editor that tells you that if your story isn’t perfect right away, then it isn’t worth writing. NaNoWriMo gives the wanna-be writer a ridiculous goal: 5o,000 words in 30 days. If you want to finish, you have to keep writing. When the story stalls, you have to keep writing. When the story takes bizarre turns you never planned, you have to keep writing. When the story starts to look like just a bunch of clumsy words, you have to keep writing. There is no time to go back and edit. There is no time to polish up that prose. There is no time to lose momentum in research. If you want to “win” NaNoWriMo, you just have to write. I “won” that first year, writing 51,008 words. There was a beginning, a middle, and end. There was also a huge digression into what should have been an entirely different novel, and there was a character I referred to as a “brother ex machina” when he appeared halfway through. Somewhere, I have a print-out of that story, that novel, and that is the only copy, since that particular computer crashed and went to Digital Heaven six weeks later. I took on the NaNoWriMo challenge again in 2003 and 2004, but both attempts remain unfinished. The 2004 novel stopped at 32, 143 words. The 2003 novel met a sad fate. It exists as several “untranslatable” files. And that was that. Until this year, when I got an itch to start writing again. When I saw a mention somewhere about the authors who would be doing the pep talks this year, I signed up just to get those in my inbox. And, of course, I couldn’t just leave it at that. So, on November 1st, I started a new novel. You can see my word count in the sidebar. As of this moment, I am at 42,012 words. Apparently, if I don’t write much fiction for a few years, it all comes pouring out at once. It’s a messy first draft. I’ve shifted character’s traits and altered the timeline in ways I will need to go back and fix. I have things that need to be researched to round out my best guesses. But it’s a draft. There is an actual story there, on the page, instead of just floating around in my head. And, more importantly, I’m writing every day. For me, that’s the point: to get back into the habit of sitting down at the keyboard and putting words on the page (screen, whatever). After November, I can revise. I can edit. I can turn this messy draft into a real story. I can work on the art and craft of writing something worth reading. It’s not too late for you to join in. You know the scare-quotes can’t be good news, right? I signed up for the 10K event of the Ovarian Cancer Coalition Run a while back, when I was using the RW training plan. In the Higdon plan, which I started with and then switched back to, today was supposed to be a 5K race. Hey, I split the difference! But we’ll get to that. I was a little nervous about doing a 10K, but after last week’s 6-miler, I was feeling more confident. I arrived early, since I needed to pick up my shirt and race bib. I walked in the front gate of CBS Studios, but there was no indication of where to go from there. (Had I parked in the parking garage rather than on the street, this probably wouldn’t have been a problem.) I asked the guard at the gate where I was supposed to go. He asked if I was there for the event or to volunteer. If I were a volunteer, I would have been wearing longer pants. Just saying. Once I found my way to the registration desk, I got my number and timing chip, and wandered around the Health Fair, which was just getting set up. The Goodie Bag table had a small, nearly hidden sign, and the t-shirt table had no sign at all, leaving a few people asking if they were supposed to pay for the shirts. The race information had said that the 5K run started at 8:00, the 10K at 8:15, and the 5K walk at 8:45. I saw a sign when I walked in that said the 10K would be at 8:30 and the 5K walk at 9:00. I was not expecting the local pastor (who lost a family member to ovarian cancer) who led everyone in a prayer. After that, and some announcements, and the National Anthem, the Laker Girls led a brief warm-up. The 5K runners got started around 8:10. Then, it was announced that the 10K run would start in about half an hour, “after the 5K runners finish”. I can only assume that announcement meant to refer to the leaders of the 5K run, and not the back of the pack folks. So, we 10K runners meandered around, keeping warm, sampling bits of Yummy Cupcakes, sipping water, waiting, waiting, and waiting some more. Another announcement: there had been some sort of problem with the course, and 5K runners being sent the wrong way, causing a delay. Finally, the Laker Girls came back out to do another 5-minute warm-up, and then we were off at about 8:40. The first mile was a zig-zag through the studio lot and out the gate. Inexplicably, there was a water table just .1 mile in. I skipped it, settled into a comfortable pace, and finished mile 1 in 11:52. About a quarter mile later, I rolled my right ankle. I was running along, listening to my music, scooting over to the right to move between the person just ahead of me on the left and the curb on my right, when my foot just flipped. I ran a few more steps, then slowed to a walk. It was exactly that sort of roll that ended my marathon training in 2002, and that broke my left foot in 2001. But after a little walking, I sped back up, and finished out mile 2 in 12:08. 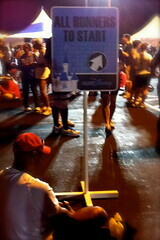 I took planned walk/GU Chomp breaks at miles 3 and 4, as well, finishing those miles in 12:09 and 12:03, respectively. It was somewhere around mile 3 that I realized that there was something very wrong with the course. I had set my Garmin for a “quick workout” of 10K at a 12:03 pace, so it was counting down from 6.21 miles. It said that I had 3.5 miles to go when I passed the “4” marker. The 2-mile marker was also, according to the signage, the 5-mile marker. Yeah, not so much. When I crossed the finish line, I knew the time was impossibly fast for me to have actually done 6.2 miles. The Garmin says it was 4.85 in 58:16, for a 12:00 pace overall. At the Results Table, they had posted the times for the first two 10K finishers (both of whom were in my age group), who had finished in about 30 minutes. Overall, it was a little disappointing. I was looking forward to setting a 10K PR (since it was my first 10K, you see). And running a 10K had been one of my goals for 2010. I’m going to look for another one, but it’ll have to be in November or December, after the Half-Marathon. The Higdon plan actually calls for a 10K race in a few weeks, but there aren’t any local races that weekend, so I’m planning on a 6-mile run that day. At the moment, I’m icing and elevating the ankle, since it started hurting again once I stopped running. I’m really hoping it’ll be enough to head off a real injury. Addendum: I’ve checked up on the official results, and my chip time of 58:12.3 placed me at 17th in my age group, 83rd among women, and 136th overall. The top man finished in 29:58, and the top woman finished in 36:19. Whatever Happened to the Knitting? Leave a comment on Whatever Happened to the Knitting? Hey, isn’t this supposed to be a knitting blog? Well, I think so. I mean, it even says “knitting blog” right up there in the tag line. Seriously, I really have been knitting, not that you’d know it from the blog. I’ve been working on something I can’t show you, which doesn’t make for very exciting blogging. No, it’s much more exciting, I know, to hear about the running. 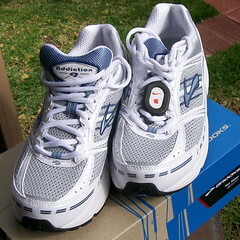 I took the new new shoes out for another 3-mile spin this morning, hitting an average pace of 11:18. Sub-11-minute miles will be mine, I know it! And when I get below 10-minute-mile pace, I’ll officially be in better shape than I was in the seventh grade. It’s good to have goals. The Addictions are firmer than my old Sauconys, but they felt much better on this second run than they did the first day. Maybe it would have been a good idea to wear them around a bit before running in them? I’m pretty sure the first time I hit the high school track (which happens to be made of a reddish dirt) will take care of that. After leaving the running store with a new pair of the same shoes I’ve been wearing, I had serious second thoughts. So, I set them aside for a few (okay, 10) days and thought about them some more. And then I put on my old shoes and went to a different running store. The store was busier than any running store I’ve even been in, and it was the middle of the afternoon on a Friday. While waiting for a salesperson, I browsed the wall of shoes and the clothing sale rack. My number was called (yes, they use numbers, like a deli counter), and a friendly saleswoman sat me down and asked about my running. She checked the fit of my old shoes, then brought out a “tester” pair of shoes and watched me run up and down the sidewalk outside. Eight pair of shoes later, I became the proud owner of a new pair of Brooks Addictions. I took them out for a 3-mile run this morning. Sadly, they did not magically make me faster. I guess I’ll just have to keep working on that. Wednesday evening, I decided to give the group run another shot. I got there really early this time, because I wanted to check out some new shoes. After trying on a few different pairs, I ended up with a new pair of the same shoes I wore in. Go figure. By the time I was finished shopping, runners were starting to arrive. I got to chatting with a few people, and then it was time to run. And, just like last week, by half a mile in, everyone was well ahead of me. But it was okay, really. I know the route now, and it’s nice just to run different streets than I usually do. And afterward, there were free 32-ounce water bottles. Hooray for free stuff! I wasn’t sure what to expect from Family Camp. I spent some lovely summer weeks at Girl Scout Camp as a kid, sleeping in a mosquito-netting-swaddled cot inside a platform tent, eating questionable breakfast foods, and facing down packs of daddy longlegs in the oversized outhouses. Seriously, I had a blast those summers, but those are the memories that have stuck with me. 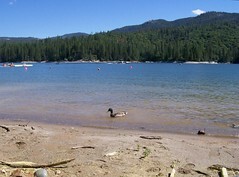 Skylake turned out to be a great vacation. Our trip started with a long drive up the freeway. We stopped in Coarsegold, which was a little disappointing as a tourist attraction, though we did have a tasty steak dinner at the Grizzley Bear restaurant. We wanted to get some fudge from a little shop, but it was closed when we arrived Thursday afternoon and again when we drove back on Sunday. 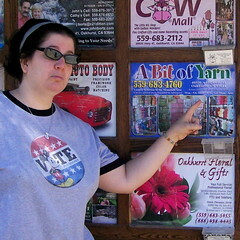 A board advertised businesses in nearby Oakhurst, including a yarn shop! Too bad it too was closed when we drove up on Thursday and again all day Sunday. Bummer. There were campfires and songs and s’mores both Friday and Saturday night. The food was really good, well worth waiting in line for. There was a lot going on during the days, too. 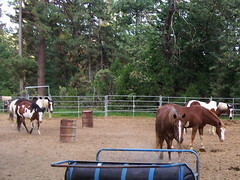 Campers over age 6 get a trail ride as part of the package, while the little kids get a chance to ride the horses around the ring. K and I skipped our rides in favor of getting Little Miss two ring ride sessions. On Friday, kids could make sand candles (which I did at camp when I was a kid!) and plaster casts of their hands. Saturday, there was tie-dyeing. Unfortunately, we hadn’t thought to pack plain white t-shirts, so we skipped that activity. There were ping-pong and foosball tables – Little Miss developed quite the nice ping-pong serve. Just outside our cabin was a sand volleyball court that the kids spent hours digging up. While Little Miss worked on a sand castle, I pulled out my knitting. I managed one round on the Lotus Blossom Tank before realizing that I just wasn’t going to be able to focus on a lace pattern while chatting with people. There was a young girl there who was going to take a knitting class sometime after camp. I would have taught her to knit then and there if her left hand hadn’t been wrapped in drying plaster at the time. 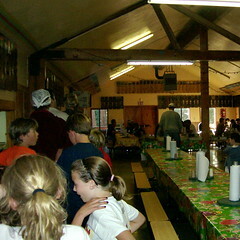 Several families had been coming to camp for a number of years and knew each other well. Everyone was friendly and welcoming, and mostly understanding of the three-year-old shouting early in the morning. After repeatedly saying she wanted to go home on Friday and Saturday, Little Miss didn’t want to get in the car to leave on Sunday. I’ll take that as a positive review.